Among the belt sander and orbital sander, the orbital sander is the best. An orbital sander is used to give a finishing the wood surface. The review will help you to choose the best orbital sander. The machine is very handy and has orbital motion in it. Among all of the sander machines, I will pick eight of them. Hand sanding takes much time and the orbital sander saves your time. It also saves your labor cost. You can use this machine at any kind of wood surface. It removes materials from the wood surface very easily and quickly. It is very suitable for use. There are many orbital sanders in the market. But I will just discuss the best all-around sanders available on the market. 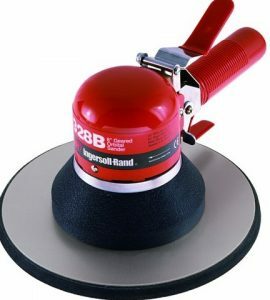 So, here we go for the best random orbital sander for woodworking. 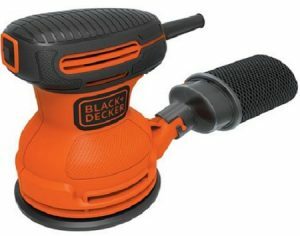 With very fast motion the BLACK+DECKER BDERO100 Random Orbit Sander is on the market now. It has magnificent material remove efficiency. It will help you to utilize your innovative ideas in preparing the wood projects. It has a random orbital action to the wood surface. The material removal rate is very high. You can change the paper easily because it has a hook and loop system. A dust sealed switch is also included into it for keep out all the dust. It is only 5 inches. The whole weight for this product is 3.16lbs. And the dimensions are 7 x 5 x 6 inch. Two years of warranty are given with it. This is one of the best hand sander as well. Very fast orbital action which helps to remove the materials from the wood surface very easily. Hook and loop system installed in it for fast changing the paper. Very lightweight and that is why it is very easy to bear and use. Does not heat up while working. Very comfortable to work with it. only 2amp of capacity though they listed it for 5amp. 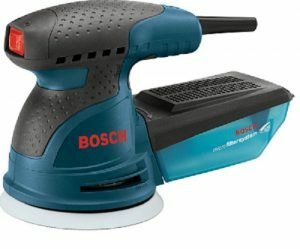 Bosch Company has brought you an orbit sander with carrying bag. It looks very fashionable and easy to use. It comes with 2.5 amp motor and has different speed variations. With the change of your work piece’s surface condition, you can change the speed. In a word, I can define it by the word versatile. It also has a dust collector which can easily be detached. The dust collecting port also has an indicator to show you the level. You can change the paper with ease and comfort as it comes with the hook and loop facility. Because of very lightweight it is very easy to bear and you will find comfort while working with it. With the help of grip, you can hold it smoothly. With diminished swirl marks it gives a great finishing to your wood piece. The cord length is about 8 feet. Disc size is of 5 inches. Total weight of this sander is 3.5lbs. The dimensions are 9 x 5 x 6 inch. It works in 120 volts. It has 30 days money back guarantee with a 1-year warranty. No matter what the task is because it has an excellent speed changer. The lightweight will give you extra comfort. You may have to change the dust port frequently as it does not have a huge storage. Here comes the DEWALT D26451K Corded Random Orbit Sander with a dust bag which is made of cloth. Are you searching for the best sander? Then dewalt orbital sander can be your one which you are searching eagerly. With a fashionable look, it is available on the market. The motor capacity is 3amp and it is really fast. It has great orbital speed. It comes with a disc of 5 inches. For a smooth finish, it uses the very high-speed motion. It removes the materials from the wood surface easily. The grip has anti-slip texture not to slip down from the hand while working. Its quality is very good and perfectly manufactured to work with it comfortably. DEWALT orbital sander has the dust sealed switch installed. The dust bag has a vacuum adapter which helps to collect maximum dust with it. It has also the hook and loop system installed for changing the paper easily. It is designed to change the discs very quick. It is certified with the term that it is totally frustration-free. Total weight is 5.75lbs and the dimensions are 9.5 x 13 x 6.8 inch. It has 90 days of money back guarantee and 3 years of limited warranty. The motor has a great speed to apply. The dust bag with it is very durable. Good quality with the fashionable look which will amuse anyone. As it has more weight than the regular weight your arms may be tired for holding it for a long time. Confused with the pressure that you should give through a sander? 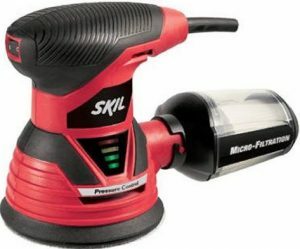 Here it is the SKIL 7492-02 Random Orbit Sander with pressure control facility. Whenever you will give extra forces over your wood piece the pressure control system will warn you. The pressure control sensor in it works very fine. It has random orbit motion that is very fast. It removes the material from the surface easily with help of its high speed. It also has a pad break. It comes with the dust seal switch. It will ensure you that how well it works for you. This machine is durable and very easy to use. The disc size is of 5 inches. It is the best in the market. The changing process of the disc is also very easy. The canister catches all the micro dust completely that there is hardly any left. Total weight is 4.7lbs. The dimensions are 10 x 8 x 6 inch. It has 30 days money back guarantee with 1 year of warranty. It comes with dust sealed switch. Lightweight and best grip to grab it on hand. If you work with it for a long time then your arm may get pained. 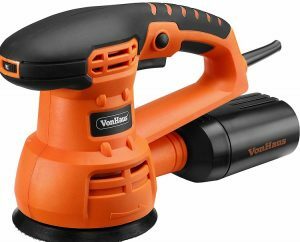 VonHaus Company has brought this sander to the market with various accessories kit. The sander/polisher works very well on the wood surface. It removes materials from the surface of the wood and gives a great finishing. It has tremendous speed variation. The speed can easily be changed. It comes with 3 polishing pads with it and has a dust extractor. The pads are easy to change. It has the 3.5amp motor connected with the orbital disc. The disc gets great motion from the motor. The motor comes with the lock-on system in it. You can adjust the speed of your sander as the speed varies from 6000 to 13000 rpm. It has random orbital speed with large area coverage. The 5-inch disc has the hook and loop system installed. The dust extractor helps to keep the working surface clean. It fits in your hand comfortably. The total weight for this sander is 5.4lbs. The diameters for this machine are 10 x 4.8 x 7.1 inch. It’s certified for being frustration-free. Very quick at work. It cleans the surface within a couple of minutes. Suitable in the various working surface. When to work the dust extractor may open up. The trigger lock button is set near to the grip and may cause an accident. Looking for the best sander for your workshop? Here it is the Makita orbital sanderBO5041K Random Orbit. 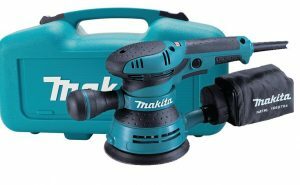 Makita Company is famous to the woodworker as it brings to the market great wood DIY making machines. For polishing and removing the materials from the wood surface you need a sander. This sander from Makita comes with the 3.0amp motor. It is very fast and smooth sanding machine in the market. It has various speed options to use. You can set your desired speed in it for getting the best feedback from this sander. The grip is rubberized to hold it comfortably. You can control it as you wish. It is very easy to operate and gives a swirl free finish to your wood piece. The disc is of 5 inches. The trigger switch is in a suitable place on the machine body and easy to grab it. It has also pad control system for controlling the speed of the pads. It has a dust bag to collect the dust. The hook and loop system is installed into it for changing the paper easily. It has very lightweight. The total weight is 3.09 lbs. The dimensions for this product are 7.5 x 16.3 x 10.3 inch. It has 1 year of warranty. This is one of the best electric sander in the market. Very lightweight and easy to bear and transport. It comes with dust bag. The motor has a great speed and the speed has variations. Very easy to change the paper. Little bulky when to hold it. This one comes with the 6-inch pad. It has variable speed and it fits for you. It spins randomly. It gives a swirl free sanding within a short time. It can cover a good number of areas at a time. So, you can call it the time saver. The motor in it is of 0.25 hp. The speed varies from 700 to 825 RPM. This machine is very rigid and durable. It has fascinating features. The orbital diameter is of 5/32 each. This can be your time when you are searching for sanders which are best then you can definitely take it. It has a dual action pad motion. It gives you a long life working facility with it. While working with it creates less vibration. It removes the dirt materials from wood surface easily and quickly. It is built of composite materials and it is air powered. Total weight for this product is 6 lbs. And the dimensions for this one are 5.7 x 12.4 x 9.2 inch. It has 1 year of warranty. Different speeds help to higher or lower the speed while working with it. Removes all sorts of material from the surface and gives a swirl free smooth surface. It can cover a huge area at a time than the others. It doesn’t have any dust port. Your arm may be tired due to long working with it. With the polishing pad, the PORTER-CABLE 7346SP Random Orbit Sander is on sale. It has super speedy motor included. The motor is of 4.5amp. The speed varies from 2500 to 6800 OPM. It has random orbital speed which gives a swirl-free finishing. The action of polishing is too good. The disc is of 6 inches. It has 24 spindle thread and each of them accepts 5/16 size. It has a side holder to hold it with ease while working. It looks very fashionable and it has a great appearance to the user. It removes the material from the surface so quickly that it will definitely please you. The machine is of 6 lbs. The dimensions are 11.5 x 10.5 x 6 inch. It has 1 year of warranty. This is called best detail sander also. It has quick changing pad facility. Comes with a side handle for comfortable use. It does not have a dust port. Have you taken your decision to buy a sander for your workstation? I know it is difficult for anyone to choose the best one. However, there are various sanders in market such as best palm sander, best floor sander as well. Hope that you have found the perfect one for your workshop. Before buying you need to give focus on some facts. 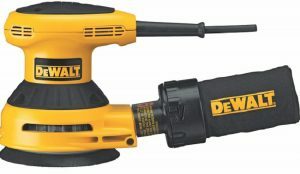 I will discuss the facts here and you need to know these things before going to buy the best orbital sander. Motor speed is a fact for the newly bought sander machine. The more will be the speed the more removing the materials from the wood surface. Motor speed depends on motor quality. A good quality motor gives the exact output that written on its body. There is no power wastage. So, when to buy I will suggest you take the one which has a high-speed motor inside. Check the speed whether it works well or not. The entire orbital sander comes with changing pad facility. For this sometimes you will need a couple of extra tools. For the hook and loop system, it is easy for the user to change the pad easily. It is also very safe to change the pad. Nothing less or more you should check the disc and pad size. Check whether the pad size matches or not. Never buy in a hurry. Take the best possible time before buying a product. You have to change the pad and you have to admit it. After knowing about the doings you should buy your one. Quality of metal has also effect on the sander performance. If the metal is not good enough then you will not find the best output from your sander. Always keep your eyes on while to buy a metallic body machine. If it is made of plastic then check the plastic quality too. Never judge a product by its outlook. It may be fashionable but the quality may harm the performance. So before buying an orbital sander, you need to check the metal or plastic quality. Except few of them, the entire sander comes with a dust port facility or with dust sealed switch facility. You need to know about how the feature works. You also need to know that when to open up the port and take down all the dirt from the dust port. It is very necessary to have a dust port in your machine. It will keep your workstation or the place you work on neat and clean. Unlike some of them, the sanders are really very good at sealing the dust. When to work with a sander machine it vibrates a lot. If you are a beginner, that may cause you some sorts of problem. Your arm may be being tired. Again your heartbeat may increase. I just want to tell you that it is not the matter for you to be the worry. The vibration does not cause any harm to you. So, just stay relaxed and buy your one. When the issue of safety comes then you need to be very careful about it. Though the sender does not have any sharp edge it spins at a great speed. The speed can harm your hand and you can use a hand protector for your hands. Again It makes sound and produces small micro dust from the machine and surface’s contacted area. It can harm your ear and eyes. So, you need to use an ear guard and eyeglass for remaining safe. You also can wear an apron. Be safe always. As this is a machine you should maintain it. There is a motor and other machine parts that need to be lubricated. You need to use lubricants for lubricating the motor and the machine parts. It may cost you but it is very necessary for your machine parts. Again you need to change the disc. You also need to clean the machine after work. It will be beneficial for you to buy a sander machine for your workshop. The best sanders can give you maximum output. They can put the finish mark without any swirl. Many of them are certified as being frustration-free. Always choose the one which fits for you. The described products are the best on the market. You can choose one or more from them. To use a sander as a beginner you need to connect the sander to electric power. While plugging in you should be careful and notice that whether the machine is on or not. Never plug in the wire when the switch of the machine is on. It may spark on the electric board or can do harm to your machine. Don’t use your wood sander machine to any metallic body. It will decrease your machine’s work ability. Never try to touch the spinning area with a bare hand. Never try to clean your machine while it is running. Most of the sanders have the warranty with them. Before buying you should check the warranty and guarantee (if any). If the weight of the sander is high then it may create the problem for you. For a long time working your arms may tired. Never take your machine with the contact of water. As it is an electric machine, water is the dangerous enemy for this. Keep your machine away from children. Q: How to change the paper or pad? You will find many videos over internet-related this. However, to change the pad you will need to use an additional tool. The tool will come with the machine. Q: Is the vibration harmful? It’s hardly harmful to the heart patients. Best orbital sander is very much needed for giving a great finish to your wood project. As you are a wood lover then you definitely need a sander for your workshop. For every kind of wood project, you will have needed this. This is very easy to use and easy to work with it by placing it in hand. Hope that in the meantime you have found yours one to buy. These all are the best orbital sander. They have excellent performance and accuracy level is near 100%. So don’t be late. Grab your one which one is perfect for your workshop you think. Click to buy your one.